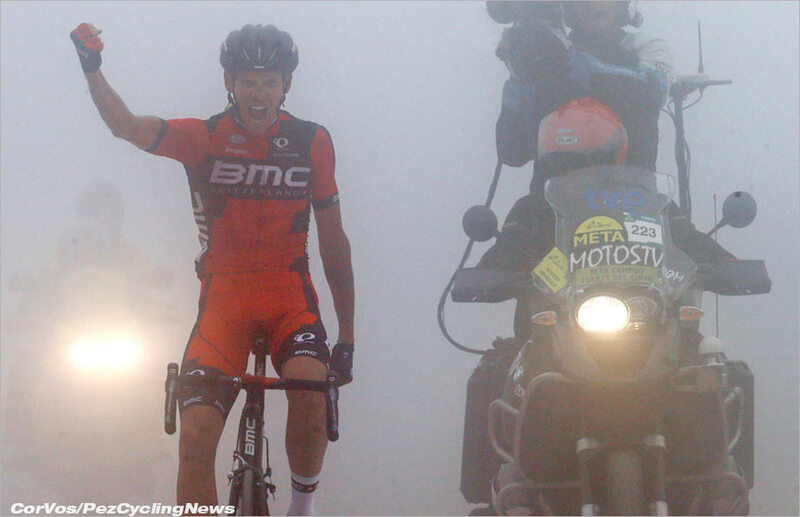 Alessandro De Marchi (BMC) took a brilliant win to perk up his team after news of Sammy Sanchez's abandonment. In the GC Quintana came out on top but the time gaps were limited on the long shallow finishing climb. The mountain stage began with a 5 man break, De Marchi, Carlos Quintero, Mikael Cherel, Salvatore Puccio and JJ Rojas going clear. Their lead was initially kept under 6 minutes but as they hit the second climb of the day the break were content to let them go and it soon extended to over 10 minutes. On the final climb there was a stalemate in both groups until the final 5km. Cherel tried time and again to get away, but de Marchi's legs and ambitions shut him down each time. Rojas and Puccio were the next attackers, they were slowly brought back single-handedly by De Marchi who then jumped past and took a brilliant stage win. Aru was the first rider to attack from the GC group but Quintana was able to go with him and later put time into the young Italian. Tom Dumoulin was another loser on the day but he still stays within a minute of the red jersey. He needs to stop the slide on the next two days if he is going to take back the jersey on the time trial stage. After two lumpy transitional days we're back in the high mountains. We have a 215km stage from Vitoria-Gasteiz, the capital of the Basque region to the hors categorie climb of the Alto Campoo, taking in three categorized climbs - the 3rd category long but shallow climb of the Puerto de Estacas, the 1st category Puerto del Escud which maxes out at 15%, and the final Alto Campoo climb which has an average of just 5.5% for its 18km but the penultimate kilometer has a gradient of 10.3%. 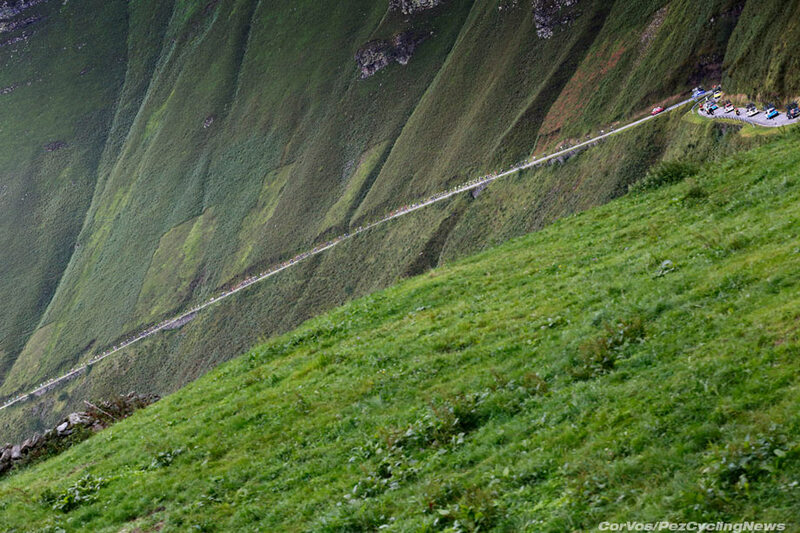 Because of the gradient of the final climb we will probably see quite a large group battling out for the victory. Don't expect any of the main favourites to trying anything before that penultimate kilometer, it will be a waste of energy when the terrain is so 'flat'. The day started with more bad news for the BMC team when it was revealed that Samuel Sanchez, 20th in GC, would not start the day. He was joined by Geoffrey Soupe (Cofidis) and Thomas de Gendt (Lotto-Soudal). Alessandro de Marchi (BMC) presence in the day's break was a tonic for the Swiss-American team, he was joined by Mikael Cherel (Ag2r-La Mondiale), Salvatore Puccio (Sky) and Carlos Quintero (Columbia). They were shortly joined by JJ Rojas (Movistar) to complete the five man break of the day. With Cherel the highest placed rider on GC, over an hour down, Astana were content to let the group's lead swell and soon they had a 6 minute lead approaching the first categorised climb. Cherel took the points over the top of the climb as the break extended their advantage by a further minute to 7 minutes. The main discussion at the start of the day had been around Quintana (Movistar) and how he would fair in this final week. He had been ticking along nicely but a cold had hampered his performance in the high mountains of Andorra and he'd dropped 3.07 down to 11th place, 1.15 down on his Spanish teammate, Valverde. The news was positive for the Columbian, he had apparently overcome his illness on yesterday's stage and was now in a position to take back time on the two mountainous stages this weekend. Although Astana had worked to keep the gap under control they had clearly given up on that task, with the race nearing the first category climb the break's lead was almost 10 minutes with a strong possibility that they could stay away. The other main talking point was the performance of Tom Dumoulin (Giant-Alpecin). The Dutchman has put in a brilliant performance so far this year with a stage win and two spells in the leader's jersey. He lost the jersey on the Andorran stage 11 but he remains within 1 minute of the lead and he has the 39km time trial in Burgos to look forward to on Wednesday. If he can navigate the next three stages and stay within 1 minute of Fabio Aru then he would be the favourite to take the red jersey back after the time trial. Back to the racing and the break's lead remained just under 10 minutes as they hit the lower slopes of the second climb of the day. At the finish the fog and cloud had descended and although it might lead to epic racing it might also lead to epic racing that no one could see. I was certainly hoping that it would hold off for the next few hours. The pace on the climb was far from frantic but it was enough to shave 1.30 off the break's lead as Cherel once again took maximum points at the top of the climb. As we made our way on the flat part of the route towards the final climb it was clear that the break would stay away as they added the 1.30 that they had previously lost, back on. 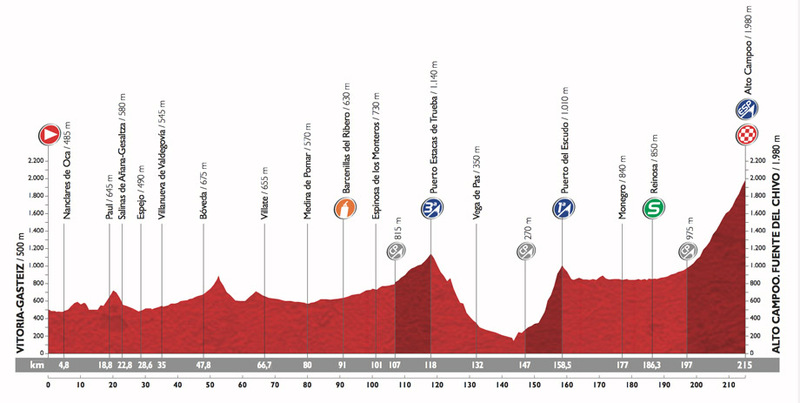 Cherel was looking the strongest on the day but De Marchi has a history with the Vuelta after a stage win in last year's race, Quintero is a dark horse for the stage win but it will be difficult seeing either Puccio or Rojas winning today. 2km from the start of the climb and the break had just shy of 10 minutes advantage. The first person to ignite the stage was Angel Madrazo (Caja Rural) who attacked from the peloton in an attempt to single handedly close down the 8 minute gap to the break. Neither the peloton nor the break looked interested in attacking yet. Movistar had taken over the pace making duties in the peloton but the main group looked content to just sit in at the moment. The breakaway was infected by this apathy as well as they were all content to ride through and off on the lower slopes. Luis Leon Sanchez (Astana) was the first rider to inject any urgency into the peloton and his raising of the pace immediately distanced the majority of the peloton leaving around 50 riders. With 4km to Cherel finally attacked, Puccio attempted to haul him back but he was unsuccessful and De Marchi was quickly round him to take up the chase. Puccio was the first man from the group to drop back leaving De Marchi, Quintero and Rojas to bring back the Frenchmen. Cherel was caught with 3km to go and the leaders sat up, safe in the knowledge that they still had 6 minutes to play with. The drop in pace was good news for Puccio who was able to re-hitch back on to the break. In the peloton Astana were keeping the pace high but Dumoulin was looking comfortable in the slipstream of American Lawson Craddock (Giant-Alpecin). Cherel attacked again but he was easily brought back back De Marchi again. The break hit the hardest part of the climb together and moving incredibly slowly. Rojas launched himself into the mist and he was joined by Puccio. Neither De Marchi nor Cherel wanted to do the work but it was the Italian who finally cracked and he quickly caught firstly Rojas and then Puccio who had moved on ahead. Fabio Aru (Astana) was the first of the main favourites to attack and he was joined by Quintana and Jasper Hansen (Tinkoff-Saxo). Dumoulin and Chaves (Orica-GreenEDGE) were distanced and they were joined by Majka who had been dropped by the Italian/Columbian duo. Inside the final kilometer and De Marchi was leading from Puccio, who had put in an incredible ride. The mist meant that time gaps were impossible and the Italian had no idea how close Puccio or Cherel were. He was still riding strongly and as the distance ticked down it was looking like he would take his second Vuelta stage win in two years. Back with the main favourites and Aru was doing all the work but as the climb eased off the gap to Dumoulin was only 20 seconds, the Dutchman was slowly hauling the Italian back. De Marchi was still alone and after checking over his shoulder a couple of times, took a wonderful stage win in the gloom. Quintana launches his attack, enroute to gaining time back on Au. 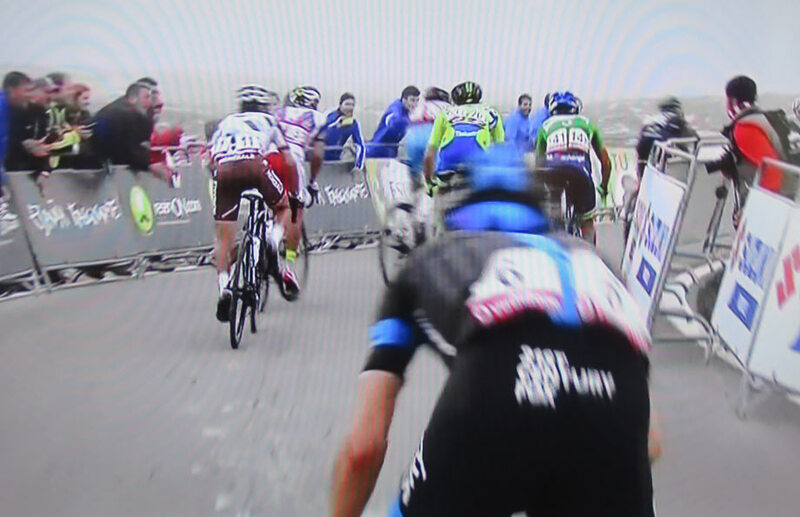 Aru and Quintana were joined by Majka, Joaquin Rodriguez, Pozzovivo (Ags2r-La Mondiale), and Chaves but the race leader was finally starting to show the cracks as he allowed Quintana to disappear into the mist. Dumoulin was losing more and more time and he was leaning heavily on the pace making of Louis Meintjes (MTN-Qhubeka). 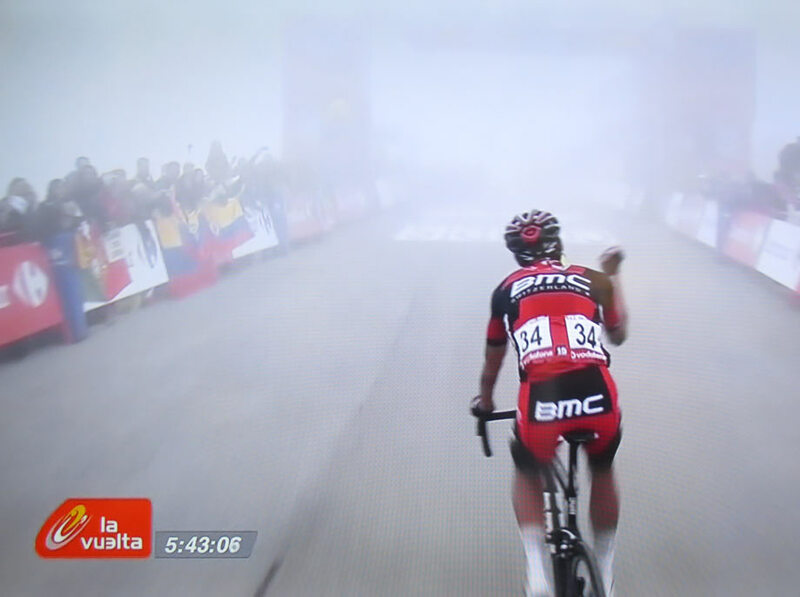 At the misty finish line the silhouette of Quintana was the first of the favourites to cross the line, putting time into all the riders ahead of him in GC. Dumoulin lost time but he was able to limit his losses to Aru to under 20 seconds. It was a slow boiler but the stage sparked to life inside the final 5km as De Marchi and Puccio traded body blows on the steepest section of the climb with the BMC rider finally winning. In the GC race Quintana announced that he was back to his best and he will relish the opportunity to put more time into Aru in the final week.